Discussion in 'Small Form Factor Systems' started by SaperPL, Sep 1, 2014. Hello guys, I'm new here - just registered to ask you some questions, hope you'll help me out. I've been looking for some time for cool and cheap steambox like case for gaming PC without luck for some time and realized there's no such thing on the market. You all know the problems - it's either big, its a cube or it doesn't support dual-slot VGA's. I want to build a case fitting mostly standard gaming grade pc parts like the steambox case. Little update and call for feedback. I'm currently doing a manual for Sentry and it would be awesome if you could check it out and give us your thoughts, especially about what you may not understand. The manual is in Work In Progress state so it's still incomplete. We're ready with the design and we sent inquiries to potential metal machining contractors few weeks ago, but it looks like most of them didn't want to bother responding before Christmas. Also we could've had the prototype made already from our local metal machining shop but they are quite expensive when it gets to small custom stuff. That way we would have a semi-useless prototype because we would need to order another one from the production contractor of choice to make the final metal adjustments anyway. Some of them might be able to make better air inlets like those small hexagonal holes before laser cutting and bending which would optimize the price and tweak case looks. It has to move early January somehow and we should know the approximated price then. I'm really sorry though for not taking that lazy December thing ahead. We're not releasing any media info or interior design because of two things: first is - unless we have a physical prototype there always might happen something we didn't think of and slight tweaks might occur. Also render is only a render. As for the current state of the case: I'm satisfied with the utility of the case within its dimensions and looks - its totally awesome and when you see the interior its something that's totally new and game changing. There are few things that are not satisfying as much as the above, like the amount of cover's screws (8) and current air inlets - those are somehow little redneck for the industry, but that's what we had to do for the minimum order amount which could be even like 20 units if not for the additional parts retail price. We have just built the first early prototype. Metal machining quality is a bit off and we're waiting for the metal machining shop to update their toolset for increased bending precision. This means another setback. The prototype lets us check out numerous little things we can now fix in the design. The internal layout, including graphics card and riser support looks good and there shouldn't be any big revolutions here. Prototype case just barely, but fits inside earlier mentioned laptop bag. Meanwhile Chieftec started shipping their SFX-500GD-C (SFX-L) which is oversized by 0.5mm. 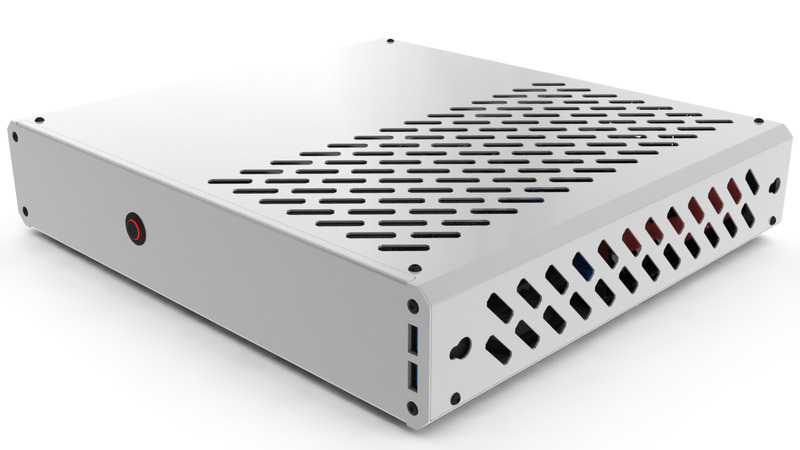 Because of that, case will now grow in height by this 0.5mm to support 64mm height SFX-L PSU's which might become more common if other manufacturers follow Chieftec's lead on breaking out of the SFX standard dimensions. While waiting for the prefered metal machining contractor to reach required bending precision we will try to order prototype parts at local shop. We've received the metal parts for the second prototype just before Easter. Sadly, it's not production ready yet. The reason is that even the local metal shop exaggerated the precision of bending they have. The problem looks to be the lack of experienced operators of bending machines and we have to take that into account for the production. Because of this we have to redesign some internal pieces introducing more margin for bending errors. It's not like we didn't have any before but it looks like it wouldn't be enough for the production. 2) We've tested the installation of whole system inside the case. Even with non-modular SFX the wiring hell looks still manageable, but for the SFX-L we'd recommend using modular cables. 3) The P4 cpu power connector will need an extending cable. We'll most likely provide one with the case. 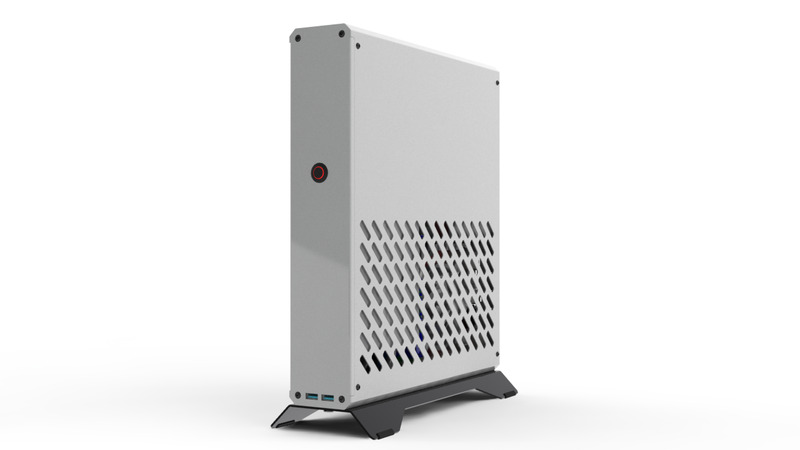 P8 doesn't look to be common at all in ITX boards. 4) The power button looks just like the one on renders. The led ring is white/grey lightly-translucent plastic when not powered. Stay tuned, we are still trying to make it real as soon as possible. We just had a meeting with our supplier from the laser-cutting company. It looks like we've achieved bending repeatability. It means, next step will be repeatability in point-welding, galvanizing and painting. We're thinking about laser-cutting our case parts from the metal sheets, which are already galvanized. The only problem is that, laser makes edges which will stay without galvanized cover. Of course whole case will be painted, but in case someone will scratch it on the edge, then rust can show up. We have to think it through. If individual galvanizing won't be very expensive, than we'll probably do it in the mass production. Please also note that this is still unpainted prototype without galvanized cover, so it's a little bit rusty. At this moment it's prepared for point-welding and it's only screwed by screws. We'll be ordering the (most likely) final prototype for metal parts which will be laser cut, bent, welded together and powder coat painted. The only real difference from last prototype you've seen on photos is added clearance for powder coating and galvanized steel. Hopefully there's no much that can go wrong with it. We're completing the supply list for required items. There's two more details left for case parts - so we're getting really close. We're also thinking about packaging already. Case cover will not be sliding from behind anymore and can be freely put from the top side of the case. We're dropping the default mounting points for 3.5" drives in the bottom of VGA bay - the reasons for that are both heat of 3.5" and total mess made by 3.5" mounting points in bottom air inlet. You can still use the stacking bracket to pack up two 3.5" drives together and lay it on the bottom of the case in horizontal position. If the demand for those drives come to our attention later we'll be thinking of solving this problem. Small single slotted cards might not be perfect for such type of case because of the distance from the outside wall and passively vented separate VGA bay. Such config will probably end up mixing the hot air inside the bay. I'd recommend some additional fan to induce the airflow if someone totally needs to use a single slotted card for gaming. Expansion card area is also passively vented so we recommend graphics cards with open air cooler for best cooling performance. CPU, motherboard and PSU's are cool and quiet on stock intel cooler. Open case scenario - still hitting ~80 degrees cap. Note that R9-270X was thermally capped for the sake of comparison with GTX 970 which has lower TDP and the fact that those temps are average from multiple gaming loads. R9-270X has average clock pretty close to its advertised 1100mhz boost clock and in vertical position it was running at 60 degrees - it means that in most full load scenarios it hit its power limit and it was able to run as cool as 61 degrees by average. And we could get those 60 degrees because reduced power limit and vertical position granting access to all the fresh air it could get. Summary in games. CS: GO excluded because of VSync cap. Since this is a community project, we decided to reveal the costs of finalized design of SENTRY and its most probable price selling point (we never had anything to hide J). We’ve made 5 prototypes of SENTRY with 5 or 6 pre-prototypes. The average cost of each of those 5 big prototypes calculated by our accountant was over 4500 USD. If we would like to sum up everything, it would be nearly 30 000 USD per those 2 years of our „small hobby project”. Of course we didn’t pay all of those money from our pockets, because most of them are our development „working hours”, which we treat as spent for our hobby, but it also includes materials, production costs, checking quality of different manufacturing companies, our travelling between those companies, checking different types of manufacturing methods, ordering small batches of many SENTRY components (most of them just for check), etc. You all know that we are not a PC-case manufacturers, but we make wind turbines and other heavy-duty stuff, so we understand that, we won’t be doing SENTRY for ever… and we are OK with that. We wanted to make SENTRY as cheap as possible, so we set our profit on a such low level. In time it can rise up to 20% if there won’t be any quality issues in over 100pcs batches (this 10% reserve for handling warranty can change into our profit), plus another 5% if we will get better prices for SENTRY components (if our indiegogo campaign gather bigger number of orders). Some of you will say it’s still not as profitable as PC-cases made with molds in standard PC-cases factories (often over 100%), but for us it’s enought as for a small hobby project, which we’re not doing for living but mostly for fun and as our company’s promotion. All of those moves we are making simultaneously, so please do not look at them like this is a straight timeline made point-by-point. What is more, we are not giving any dates, because we are also waiting for answers from our subcontractors, and we still didn’t get them. Not everything depend on us in terms of time. I hope this update satisfied your curiosity (at least for now ). scojer, DTN107 and Pleiades like this. I see you too are interested in SFF PCs. I think the most important question firstly is the layout of your case. Where is the gpu in relation to your motherboard? Is it going to be parallel to the motherboard, like the steam machine? Personally size matters a lot to me, so I would want the smallest case. I don't care about mATX, especially if it makes the case bigger. ODD is not crucial to me, although it is to a lot of people. Power supply is interesting. Most people like their SFX power supplies, but I would not mind a DC-DC power board and AC adapter, especially if it makes the case smaller. - Is size this crucial for you as for me it is? I'd like to have console form factor - 7 litre max case. Yes, of course. Otherwise why bother? - How about silence and thermal conditions? Do you need to put high-end VGA's inside? 11" graphics card support is almost a must, since you never know how long the next gen will be. - Would you sacrifice some of the space(get slightly bigger case) for mATX support insead of ITX? In a steambox setup with risercarded graphics card a mATX board would actually be counterproductive, as it would block parts of the GPU cooler. - Would you rather want externall passive PSU instead of internal SFX one? Internal. The way things go 400w for the PSU is a must and it's neither easy nor cheap to find external solutions for that. - What pricetag are you interested in? $250 if it looks the part. Not for me. But a slimline slot-in optical should easily fit in there somewhere. 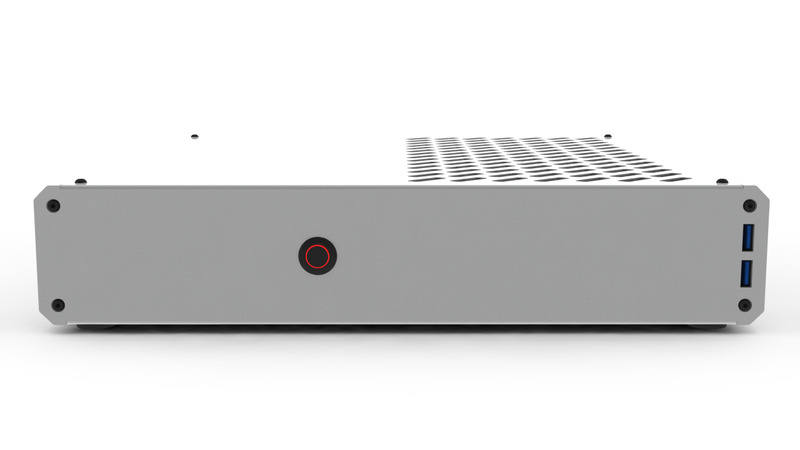 Silverstone already has 3 iterations of their steambox, NCASES are working on theirs right now (see other thread). So find way to make things better. You will limit your target audience by restricting GPU length below 10" or requiring external PSUs which aren't readily available above 200w everywhere. To be honest if you do all of this, you'll be making a case extremely similar to Necere's new NCASE project, dondan's new B3 project and also the valve prototype. So I suggest you make something different with this. It could be making the case smaller, using a DC-DC board, only using short graphics cards, I don't know. But make your case unique and target a particular audience; don't try to please everyone. What exactly would be different with your case that the Silverstone RVZ01B doesn't already cover? For me, I would like to see a case that's far lower in price than the RVZ01B. @rawrr - To be precise it's not about making something different just because there are similar projects like this - we've got the steamcase prototype yet nothings there in reach for end user yet. RVZ01B is quite fat - its 14litre design while steambox case as I remeber was something just below 7 litre. 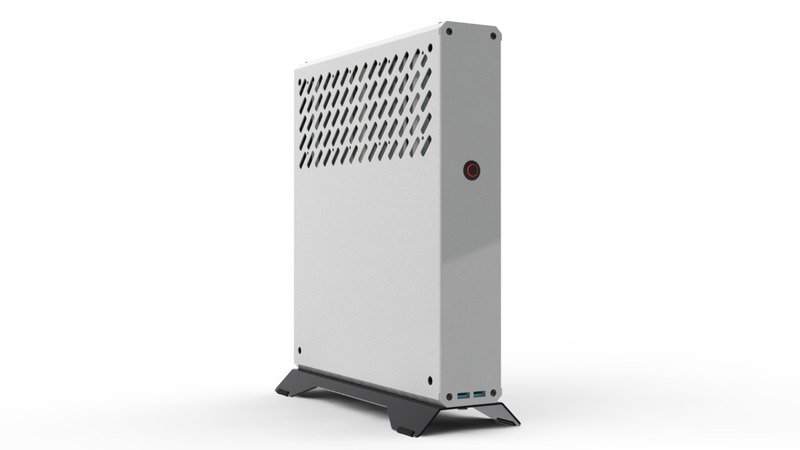 Also RVZ01B is seriously ugly - the new NCASE is probably the simplicity in looks I'd also aim for. About the cost - yeah thats it - i believe that case shouldnt cost more than fifty bucks but cannot guarantee this until we get the initial designs ready and count the manufacturing costs. $50 is going to be hard to do if you're planning on using a PCI-E riser. For regular consumers, PCI-E risers are about $20 to $25 alone. Yeah, I get it, I haven't researched the riser's yet but the prices for them are like that because that's a custom unpopular item not because its expensive in material. - Would you sacrifice some of the space(get slightly bigger case) for mATX support instead of ITX? Size should be as small as possible for me. 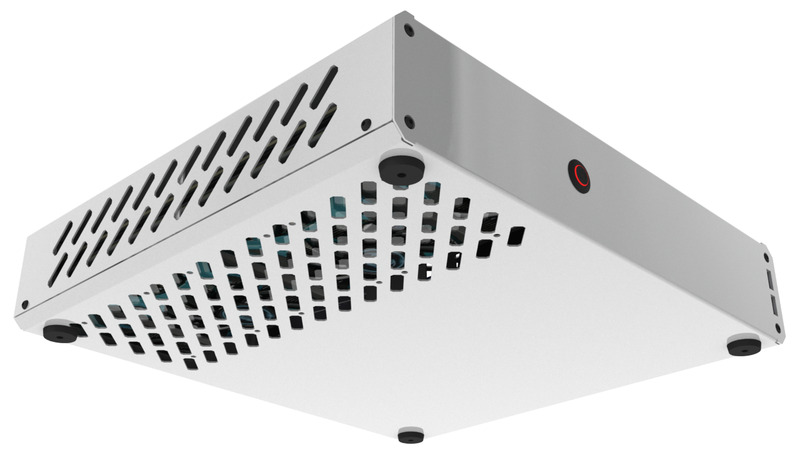 Check the NCase steam-box - huge one. Please consider shorter video cards instead of going full size. There are now too many ITX sized (17cm long) cards, so a volume reducing can be easily achieved. ITX MB wins every time over mATX. Internal PSU is preferred to me, even if not standard one, as long as its with decent quality and provided with the case. I like the idea with reversed VGA. FYI there's an Azza branded "steambox" style case on Newegg currently for $45 shipped after rebate. The thing is often when you implement an internal psu, there will be enough space to put in a longer graphics card. The only idea in my head why it could cost this at this moment is cost of connector coating ( not the slot). printing the board itself shouldn't cost too much except for this one thing. Thanks for info on Azza - still it looks like crap and is quite big. @rawrr & niksus - I'll try to figure out the 17cm long cards and internal psu combo by numbers today and maybe draw some boxes in cad to show my ideas. The cost is in the flex, not the in the PCBs at the ends. It's not just a row of wires with bonded insulation and foil wrapped around, they're essentially 40 subminiature coax cables, capacitance matched to within very tight tolerances (this means both precision manufacture of the cabling, and precision cutting of the resulting ribbon). 1. sure, why bother otherwise ? 2. Good airflow, possibility to put silent (large) fans is crucial. Vga cards up to 250mm would be awesome. 3. nope. Itx is the way. 4. INTERNAL please. Higher efficiency, less cable cluttering, easier to keep clean. 6. OD-what ? We all have high-speed internet now, don't we ? http://azzatek.com/csaz-103-techspec.html kind of looks nice, but may be a bit short for my GPU & the USB/Audio ports are in a strange place (I like them on the front). http://www.silverstonetek.com/product.php?pid=524is good so you can put a real single slot GPU in a Element Q now, come on guys give us a 2 slot EQ. That is still no reason to not include a option, just make it a slim ODD bay. 250mm would be very long for ITX cards and too short for cards like GTX 770/780. Better to make it shorter or longer. Here's the component spacing for the idea of limiting case to 170mm cards. Includes some 5mm spacing between components. Could you turn the psu on its side to reduce width? BTW: from my calculations it looks like we could fit mATX + SFX PSU + two 250mm cards with this approach into 7.22L case which is same size as Xbox One. Sry but a height of 80mm is not possible with gpu under the motherboard and back+toppanel. Min is 99mm. Motherboard 48mm (io shield 45+2x1,5mm) Gpu 40mm + 4mm Space under gpu and 4mm over gpu + 2x1,5mm panels. And a deep of 170 is also not possible because you must have space for cables and for the bracket to mount the card. (Pcb = 170mm + 8mm Bracket) Realistic is 310x190x99= 5,8L. Thanks for noticing that - I somehow got the wrong specs of io shield(it was 40 instead of 45). I did use 38mm for gpu, as found in multiple refernce cards, now increased to 40mm at your suggestion. As for space between the motherboard and the card - motherboard space includes distance from PCB to base so I considered 5mm a fair ammount of required spece to fit 1.5mm panel and flexible pci-e extender. As for VGA bracket it could go outside the form like in some current sff cases. And that still requires the outer panels as you noted. And of course the cards with power additional power cables attached from behind would be a problem. Still that's just the response for and idea of making something small with 170mm limit. 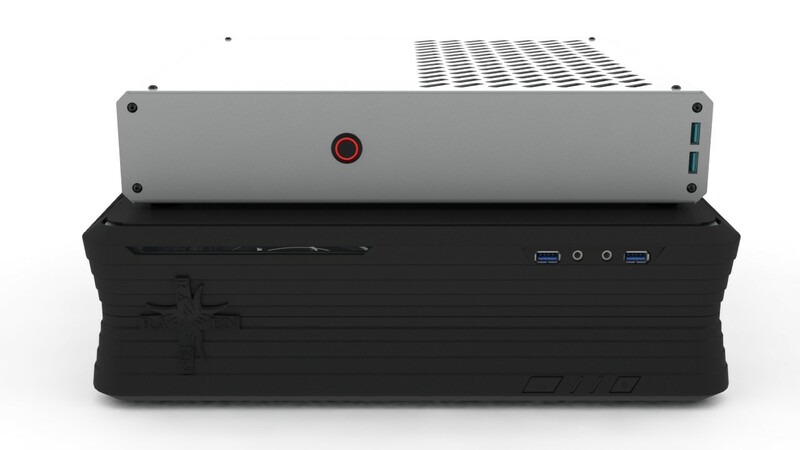 I'll rather go for slim steambox like case with full cards support. It can be 8L design, current dimensions including 1.5mm outer panels on each side are at 7.5L so I have 0.5l to grow where I need a little space. As you can see there's a lot wasted space around hard drive. I did try the TFX psu but i couldn't fit the drives with enough amount of space around. It'll be a place for drives cage and possibly slim ODD. The main problem probably will be the pci-e riser and it will require some additional space or clever design. There's also the problem with different flow of air through the PSU than of the other components so this gotta be investigated more. Also it would be inverted to take air from bottom(with distancing stands) and push it out at front and back. It'll be some kind of bracket/rail supporting the whole card. I'm not sure though how to handle the distance from the card which may vary like here with the titan - it has its own plastic shield so the bracket should be either regulated like with two different mounting configurations or has its own detachable plastic cover/shield. Some things may now seem off and risky but know that I'll leave the design work to mechanical engineers - I'm just looking for the optimal form for this project right now. I'm thinking of doing something like this (...) What do you think guys? Looks like yet another steam machine to me. I would really like a design without riser, which would also give enough height for a decent cpu cooler. the whole point is to make its form console/steambox like. A design without a riser with normal card mounting huh? Whats the point then - there's a lot of cases like that. You can provide a riser cable and screw it on the wall; most risers are such that the female end can be screwed on. Then the PCI bracket and the slot holds the card, pretty much the same as it does in a normal case. Not sure what's the problem with TFX PSUs? They are 9.5x70x100mm while TFX is 175mm x 85mm x 63.5mm -- so then you can "continue" the TFX with the longest edge of the SSD, coming to 175mm+100mm, the cabling from the TFX will be above the SSD. That will push you under 7l. Woudl be fantastic indeed for mATX + such long GPU. Alternatively use mSATA-SATA converters to shave off quite a few millimetres of the SSD. dondan in the A4 thread pointed out http://eshop.sintech.cn/pcie-express-x16-riser-card-1-slot-with-silver-flex-cable-p-96.html this riser. But perhaps a shorter is enough for this case. Yeah, I'm still thinking about which PSU type should I use. Probably hanging SSD above ram would also be possible. But you have to know the liter value is not everything. 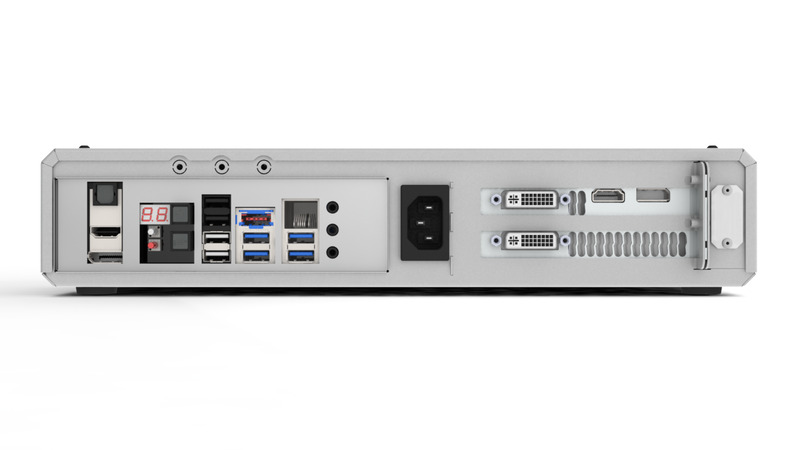 a 1u server has also less liter but the visual impression is that it is big. Yeah I know - with TFX I'ts just 5cm wider than Xbox One, with SFX I'ts same as 1U rack as u said which is 9cm wider than XBO. And there's also ofcourse the "coolness" of visual outer design. The only way your going to keep width of case short enough with the PSU next to the motherboard is with the motherboard and graphics card stacked in some fashion, parallel to each other. Back to back would give the best thermals. The problem with PSU next to motherboard with graphics cards longer than 170mm, is then you end up with wasted space at the front of the case. Thats why so many people are putting the PSU in the front of the case now. You allocate an extra 110mm in front of an ITX motherboard for GPU length, and now you have a large empty space in front of the motherboard about the same size as an SFX PSU. 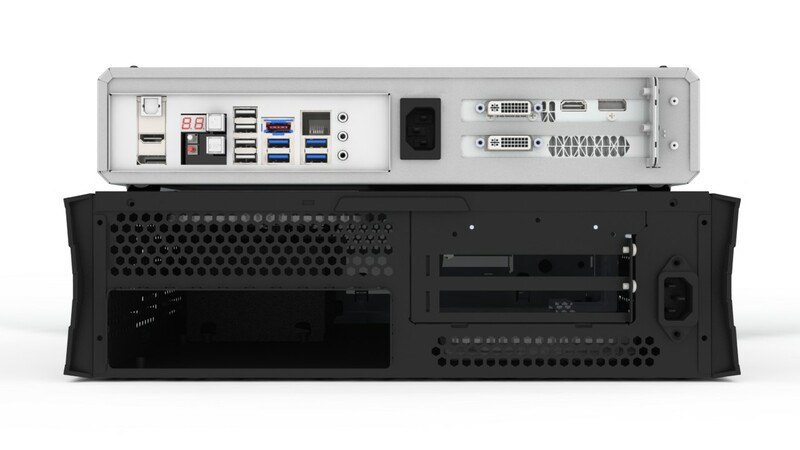 about U1 - thnx for info but that's a complete server barebone not a case you can put standard components inside. @Screes I posted the spacing visual for that approach on the first page. Maybe with TFX PSU it would be better than that but its still weird because of the riser use. I'll try to test that with models asap. Anyway its still a brick and has cpu cooling and ram heigth limits. Full ATX support and cards up to 270mm(including the connector) so titan fits with connectors from top of the card. Card support bracked would also be steering the air flow from the side to the cpu cooler. For hotter cpu's than 65W like in noctua L9 specs there's a space for H60 like complete water cooler. I could cut 1cm from height if water cooler was included/required but it would still be fat.